Call us today to schedule a free dental consultation, which includes digital X-rays, (480) 493-0046. Because of the breakthroughs in sedation dentistry, a dental visit can now be comfortable and relaxed. Perhaps you have anxiety or fear about visiting a dentist, or maybe you would like to use sedation for a dental surgery or restorative work…in either case, there are different ways that sedation can be administered. IV Sedation Dentistry – IV sedation is the highest level of sedation. We administer general anesthesia through an IV in your arm. Throughout your entire dental treatment, oxygen levels, blood pressure, and pulse are monitored to assure your safety. Oral Sedation Dentistry – With oral sedation (which is also referred to as “conscious sedation”) you’re conscious throughout the procedure, but relaxed and comfortable. Time passes quickly, and in all likelihood, you’ll have little or no memory of your appointment after it’s completed. All you have to do is take a pill. Throughout your entire dental treatment, oxygen levels, blood pressure, and pulse are monitored to assure your safety. Nitrous Oxide Sedation Dentistry – Typically, we use nitrous oxide (also known as “laughing gas”) by itself or in combination with Novocain. Laughing gas can help relax you, allowing you to comfortably tolerate treatment. Which type of sedation is right for you? In a free consultation, we’ll be pleased to thoroughly explain the three types of sedation, and you can ask questions and discuss your specific situation and concerns like side effects. 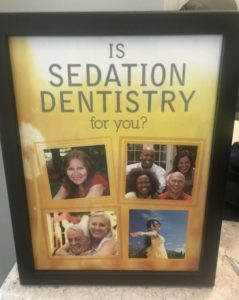 If you have more questions about how sedation dentistry works, costs and insurance, or would like to schedule an appointment, please call (480) 493-0046, or e-mail info@phoenixsedationdentistry.com. Please make note: Our dental office is in Mesa, near the 202 and Gilbert. We accept most types of dental insurance and are preferred providers for: United Concordia, United Health Care, Metlife, Aetna, Cigna Dental, Humana, Guardian, and Delta Dental.